Let me encourage you to clean your laundry room. Not just clean it, but make it cheerful and attractive. Avoiding the room won’t make the laundry go away (unfortunately) and if you’re going to have to spend time in there, you might as well look at pretty surroundings. Clean off the machines, clean under and behind the machines, and de-clutter the storage areas. Laundry rooms are often very vanilla. Inject some of your personality, even if the room has ugly old pipes. Paint and wallpaper border can do wonders for a small price. My current laundry room has a border depicting vintage fruit-crate labels in bold colors, with a couple of small pictures hung on the wall. The room is only big enough for a pass-through to the back door and a washer and dryer, but adding that touch of beauty is good for the soul. If your space requires open storage, make it look neat. Line up the bottles or buy inexpensive matching baskets or totes. Cover cardboard boxes with wrapping paper if you must. Making the area visually pleasing is worth the effort, since you’ll be seeing this space nearly every day of your life. We get in ruts when it comes to our living spaces. Time passes and we don’t even notice the lint in the corners and the collection of pennies on the dryer. 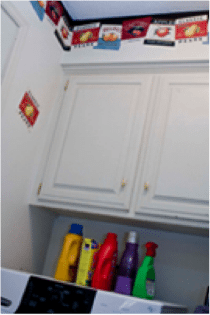 Look at the laundry room with new eyes, go above and beyond in cleaning and beautifying and see if that doesn’t give you a boost. Every little bit helps when it comes to Extreme Laundry. 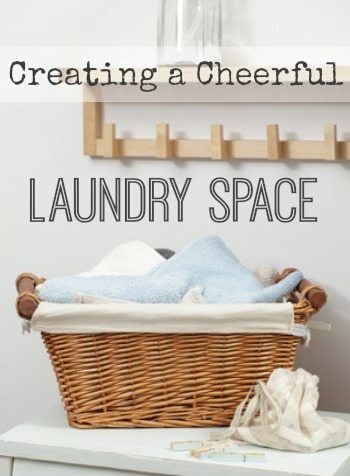 Now that you have pleasant surroundings in your laundry area, give attention to how to configure your space. If you don’t have cabinets close by, put up shelves or buy a rolling cart. Having your supplies handy will save you time and effort. If you like to buy detergent in bulk, transfer portions to a smaller container so that it’s easier for younger family members to use.